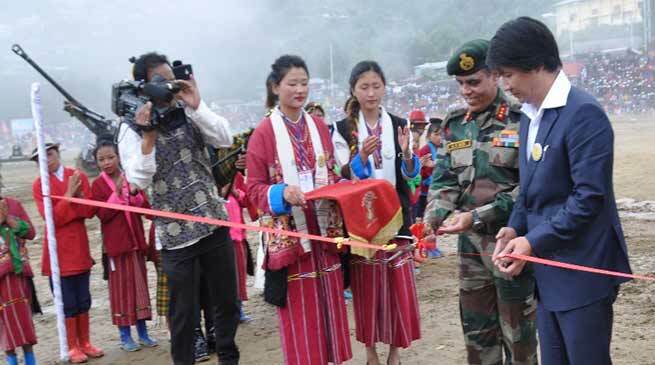 Maitree Diwas the joint Army- Civil cultural extravaganza was held in Tawang on 10 – 11 September. Symbolic of the special bonds of mutual understanding between the Army and the people of Tawang, the event which marked the revival of this special relationship after a gap of six years was once patronised by the late Chief Minister, Dorjee Khandu. Lt Gen AS Bedi, GOC, Gajraj Corps, inaugurated the two day mega event which was organised at the High Altitude Stadium in Tawang, Arunachal Pradesh on 10th and 11th Sep. Maj Gen RS Shekhawat, GOC, Ball of Fire Division, Maj Gen PN Ananthanarayanan, GOC Blazing Sword Division, Tashi Tsering and Jambey Tashi, MLAs of Tawang and Lumla alongwith a large number of military and civil dignitaries also graced the occasion. As a prelude to the Maitree Diwas celebrations, a series of events to include Run for Peace and Unity, Painting & Debate competitions, Medical and Veterinary camps were organised by the Army and civil administration. The event commenced with a mesmerizing display of Helicopters Fly Past and Combat Free Fall by the Army followed by a vibrant cultural programme culminating with a scintillating performance by military pipe bands. The festival included various events such as Weapons Display, Dog Show, Cultural show, Exhibition, Food and Game stalls. ‘Know Your Army’ was the underlying theme of the event that enlightened the youth about the Armed Forces and motivated them to adorn the uniform and serve their mother land. The young boys and girls were excited with the display of rifles, rocket launchers, mortars and artillery guns. The Army also organised a free medical camp jointly with the civil administration which treated patients coming from far off villages and distributed free medicine to them. The civil administration also came forward with exhibitions to educate the people on different plans, policies and achievements of the government. strengthen the symbiosis that was the defining relationship of the people of Tawang and the Army. The event which was the 9th iteration of the Maitree Diwas, was jointly organised by Indian Army, District Administration and YUVA Arunachal.